How to Recover Deleted / Corrupted data from Outlook PST File? To repair severely corrupted or inaccessible PST file, SysTools Outlook PST Recovery Tool provides an Advanced Scan Mode option. It repairs highly damaged PST files. It repairs and recovers encrypted PST files (password protected) in Outlook. Accidental or intentional deletion of crucial data is a curse. SysTools provides a complete recovery of shift deleted PST file data items with Outlook Recovery software. Recover permanently deleted emails, contacts, calendars, tasks, notes, journals etc. Decrypt S/MIME or OpenPGP email encryption from Outlook email messages in a PST file provided with respective passwords, certificates or Private Keys etc. 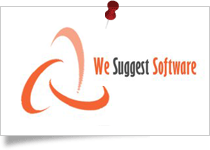 Application provides option to choose Single Key / Multiple Keys as per user's PST file. Outlook PST Recovery Software provides enhanced data item based previews of emails, calendars, tasks, journals, contacts, notes separately. The Email messages can be viewed in 8 ways, namely; Normal, Hex, MIME, Message Header, HTML, RTF & attachments. Export Selected option in the right hand corner of the software is provided for the users who needs to select and export separate emails, contacts, calendars, tasks, notes, journals in different file formats like PST, PDF, EML, MSG, HTML or into account. The Outlook Recovery Tool has 2 different options to add the PST , BAK file. It automatically searches PST, BAK file, if it's location is unknown for the user. This features can also used to repair multiple PST files in bulk by loading all the PST file from the drives. Fix inaccessible PST file corruption issues. 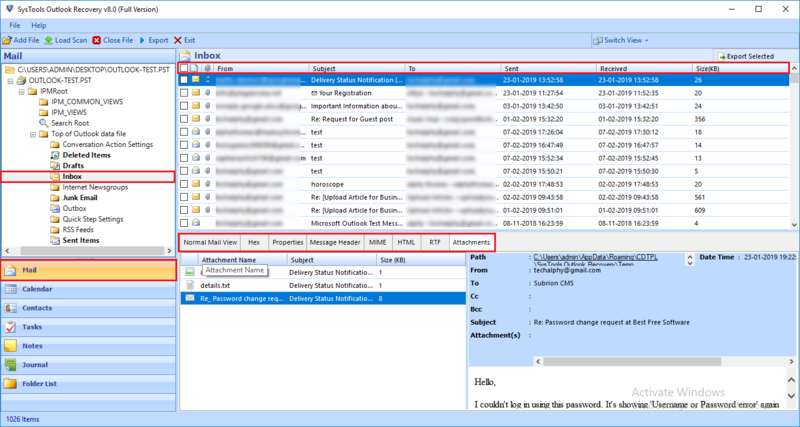 Repair encrypted (Password protected) Outlook PST data file without any loss. 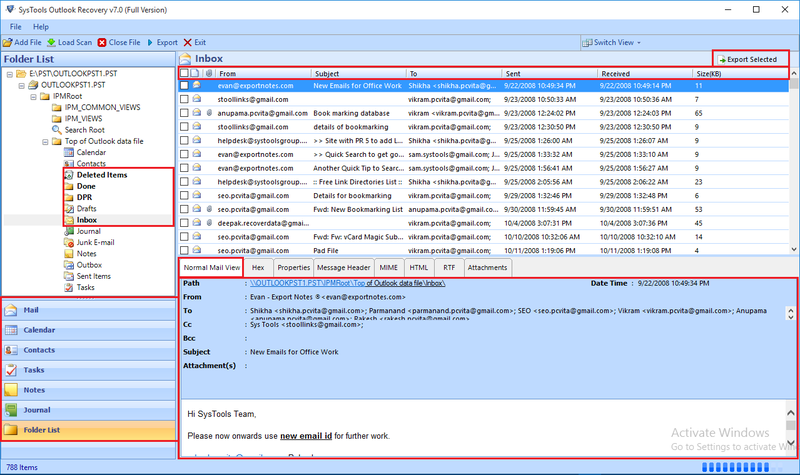 Restore permanently deleted / lost emails, contacts, calendars, tasks, notes, journals, attachments from an Outlook PST file. Decrypt SMIME/ OpenPGP encrypted Outlook messages (bulk) in PST file provided with certificates & passwords. Option to export selected items from the preview panel in the desired file format using 'Export Selected' option in the tool. Recover and repair multiple PST file in batch by selecting multiple PST / BAK files using Search PST file option in the software. 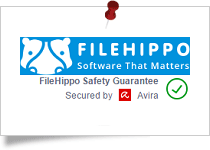 Filehippo states that SysTools Outlook PST Recovery software is a safe and secure tool for recovering and repairing corrupt PST file (Personal Storage Table). The SysTools Outlook Email Recovery software is the best utility to repair corrupted PST file without any data loss. 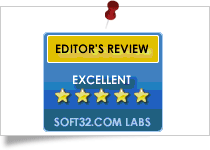 Soft32 provides SysTools Outlook PST Recovery Software gets 5 star rating for being the most effective product which recover Outlook PST file items. 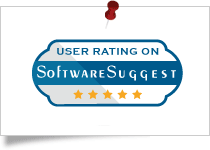 SysTools PST Recovery got the 4 stars rating from Cnet for its performance efficiency and output accuracy. 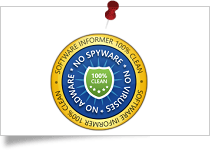 Software Informer gives SysTools Outlook PST Recovery Software 100% secure and clean award for its best performance. SysTools Outlook Recovery application gets 100% clean award by Soft Pedia for delivering Ad/Virus/Spyware free solution. SysTools Outlook Recovery allows to repair and recover Outlook PST file without data loss. Moreover, it can recover permanently deleted emails, contacts, calendars, tasks, note, journals, tasks from a corrupted PST file. 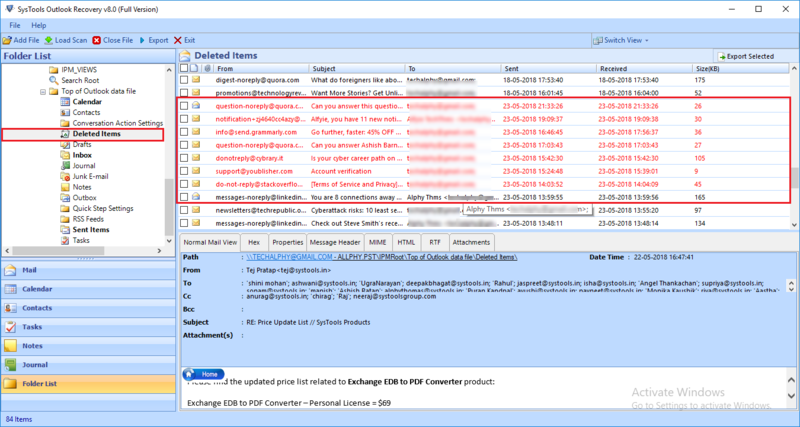 The highlight features are, this recovery tool can remove encryption from Outlook emails in a PST data file. With the latest releases of Microsoft Outlook, corruption issue caused by exceeding 2 GB of PST file size is controlled. But Outlook PST corruption keep on occurring; like Outlook crash, .pst file errors. SysTools Outlook PST Recovery can easily retrieve or recover Outlook PST files when Inbox Repair Tool fails to repair PST files with major corruptions. Recovery and repair of corrupt and deleted Outlook emails, contacts, calendars, tasks, journals data; regardless of soft / hard deletion is a feature that makes SysTools Outlook PST Recovery most updated amongst its arena of solutions. However, the modes of recovery differ for corrupted and severely corrupted / deleted data files from Quick to Advanced Scan respectively. Restoration of recovered Outlook PST file data in multiple file formats including PST. This Microsoft Outlook email Recovery tool rebuild Outlook PST data file in PST, MSG, EML, PDF, HTML. Features like naming conventions, email filters are also supported in SysTools Outlook Recovery software. It can fix corrupted PST files from Outlook 2016, 2013, 2010, 2007, 2003 & 2000. The ability to get corrupted / inaccessible data recovered from a password protected PST file as well as from an orphan PST files is what makes the Outlook PST Repair software reliable and resourceful for retrieving Outlook data files. It can easily recover password protected PST file and restore Outlook bak file data. 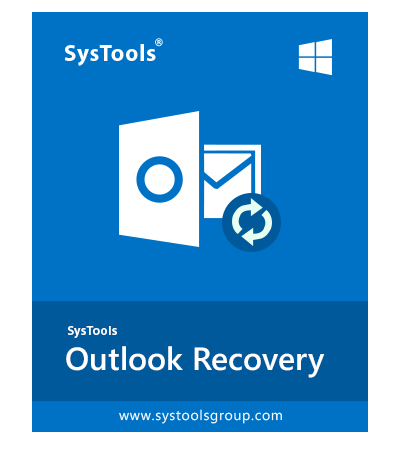 SysTools Outlook Recovery utility is excelled in recovering PST files' inaccessible items & recovers Outlook folders like: emails, contacts, calendars, tasks. The software recover permanently deleted emails from a PST file in Outlook 2019, 2016, 2013, 2010. It can also repair large Outlook PST file (ANSI & Unicode) to resolve Oversized and huge PST file issues. The Microsoft Outlook Repair tool is helpful in performing recovery of email messages and other information for Microsoft Outlook PST data files in bulk using Repair multiple PST files option. As the tool simplifies the process of recovering & restoring of data after it recover Outlook PST files; there is no need to put in extra efforts by the user. Why MS Outlook ScanPST.exe Fails? Where SysTools Outlook PST Recovery Wins? Restores PST data into a healthy state. 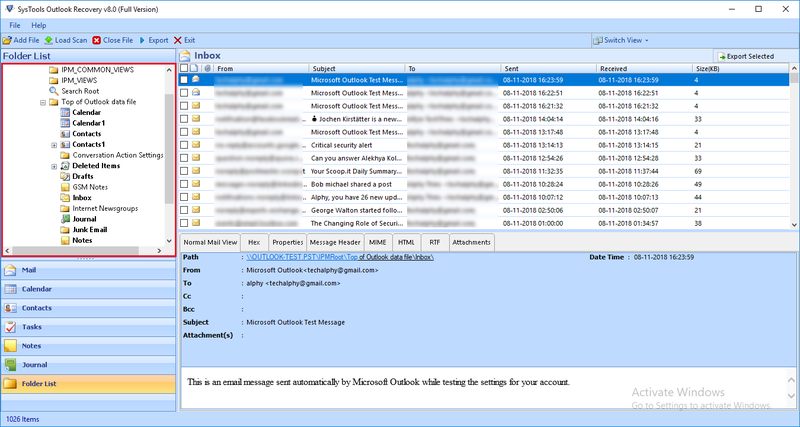 Recover permanently deleted Outlook items. What All Items You can Recover & Save from a PST File? Email Messages All email messages with Subject, To, Cc, Bcc, Sent/ Received Date, Time, Size (KB), Path, priority, inline images, links, signature will be retained during the recovery process. Email Attachments Normal attachments and inline attachment (embedded attachments) can the recovered from PST emails. Files: DOCS, PPT, XLS, PDF etc. Recovered Folders Outlook folders including Inbox, Outbox, Drafts, Deleted Items, Junk E-Mail, Search Folders, and RSS Feeds. Note: The software retains the original folder structure throughout the PST Recovery process. Date Range Filters The date range filter allows to list and export the PST Emails, Contacts, Calendars, Tasks, Journals, Notes, and Folder List of a particular time period. Previews Emails The email can be preview in 8 different ways (Normal Mail View, Hex, Properties, MIME, Message Header, HTML, RTF, Attachment). Emails can be previewed and sorted by ‘Emails with attachments, Subject, To, Sent time, Received time, Size(KB) of email’. Note: Preview of the data in an item varies accordingly. Calendar Outlook PST Recovery Software can recover Calendars with attachments, its Status, Path, Reminder, Location, Start time, End time, & Categories, Duration, Time Zone, All day event’ from a PST file. All the Daily, Weekly, Monthly, Yearly calendar appointments and meetings of a specified date range can be exported. Reminders Outlook PST appointment remainder also can be recovered and exported. Contacts All Contact items can repaired and recovered using the Outlook recovery tool. It can restore and export attachments in contacts, other details, distribution list (contacts group) etc. All the personal details of a particular contact also can be exported. Tasks Outlook PST Recovery Software can repair damaged task items and it can also recover deleted tasks from a Outlook PST file. It can also recover to do list from a Outlook PST file without any data loss. Task Attachments It can retrieve all the attachments inserted in a tasks item without any data loss. You can preview the added attachment in a task, by double clicking on it. The utility opens the attachments in a new preview window. Journals User can repair and recover journals from a Outlook PST file using this PST recovery Tool. User can view each journal item separately in the preview panel. One can easily save journals and its attachments without any data loss. Recover Subject, Category, Entry Type, Company, Start, Attachments, and Duration of all journals. Journals Attachments It can retrieve all the attachments inserted in a journal item without any data loss. You can preview the added attachment in a journal, by double clicking on it. It opens the attachments in a new preview window. Notes SysTools Outlook PST Recovery can easily recover deleted Outlook notes from a PST data file. Preview & Sort Option Software provides option to sort Notes in a PST file by its Subject, Created time, Categories. Recovered Folders Application can repair corrupted PST file and can recover Emails, Calendar, Contacts, Tasks, journals, Notes etc. PST Supported by Microsoft Outlook 2019, 2016, 2013, 2010, 2007, 2003, 2002, 2000 & below version. The default format of a exported PST file of Outlook PST Recovery Tool will be UNICODE type. MSG Supported by all available versions of Microsoft Outlook email client. PDF Generate Portable Document File which is supported by Adobe Acrobat, Reader, Web Browser etc. Using Outlook PST Recovery tool, users can repair Outlook PST files & quickly recover damaged Outlook files. This PST Fix tool can easily recover permanently deleted emails in Outlook PST file items which includes contacts, calendars, tasks, notes, journals, etc. One need to choose Advanced Mode to recover deleted Outlook emails in bulk. The tool previews recovered deleted emails in Red Color in the preview panel. Outlook Recovery Software allows to import PST to Office 365 - user mailbox, admin mailbox and shared mailbox. Move PST file items to the desired destination mailbox of account just via entering account ID & password. SysTools PST Recovery will validate the credentials and migrate the selected data items directly. With user impersonation option, it exports items to a shared mailbox. The Outlook Recovery Wizard supports to search multiple PST files from any drive on your local system. Once the entire searching is completed, you can check multiple PST files to repair multiple PST files at once. This provides advanced functionality to repair severely damaged PST Files in Batch Mode quickly using Search All Drive or Search Selected Drive option. To repair Outlook archive PST or scanPST bak file; software quickly scans a selected file automatically to repair damaged Outlook PST file. The application then loads the preview of emails with attachments, contacts, calendars, tasks in Personal Storage File (.pst). However, if the PST or BAK file has a severe level of corruption then you are recommended to go for Advance Scan mode. After performing Outlook PST recovery, you can restore Outlook PST file in .pst, .pdf, .eml or .msg formats. Repair Outlook data file .pst and saving it as EML, HTML & MSG will allow you to open & read emails in Windows Live Mail & Outlook respectively. 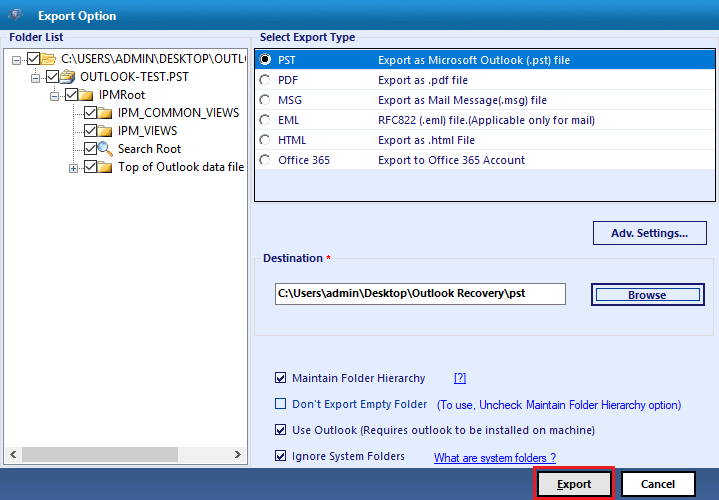 Outlook Recovery provides the option for selective export items. The software is designed in a smart way that it facilitates users to recover the embedded attachments also. These attachments are recovered as a normal attachment by this Outlook Recovery application. The formatting of recovered embedded attachment retains as original after PST file recovery. 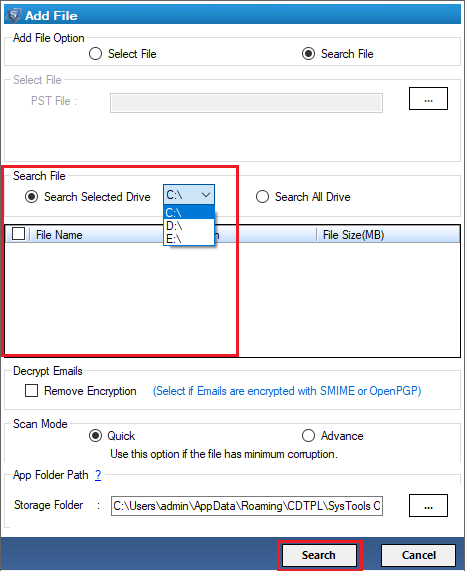 The Outlook PST Recovery Tool provides the option to decrypt & remove SMIME / OpenPGP encryption from Outlook email messages. The software decrypts protected emails with its respective certificates, keys, and passwords. The tool also previews SMIME or OPENPGP encrypted emails and save them in PST, PDF, MSG, HTML, and in Office 365 account without encryption. This PST Repair & Recovery utility allows bulk decryption of Outlook email messages along the attachments. The SysTools PST repair Tool can generate an instant preview of PST items like Mails, contacts, calendars, tasks, notes, journals, etc separately in the panel. 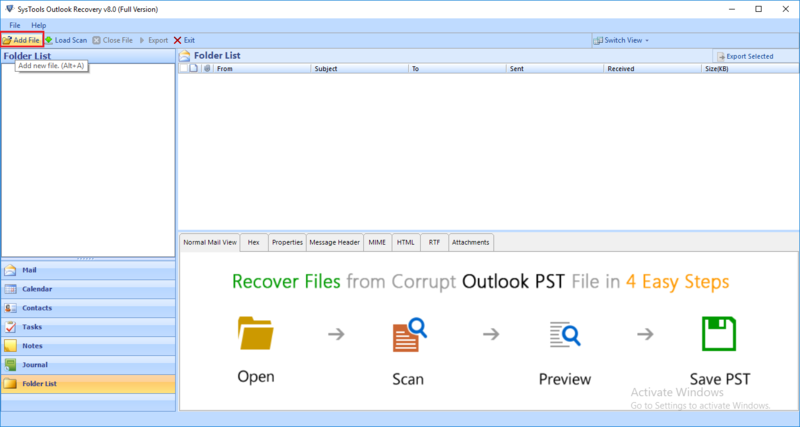 SysTools Outlook Recovery tool allows to view PST file emails in Normal, Hex, MIME, Message Header, HTML, RTF formats along with its properties in the in-built viewer. PST recovery Tool can also preview all the attachments that are recovered from an Outlook PST or BAK files. Detailed Email previews help to users to analysis it technically. The application can also be called as a Outlook.BAK file Recovery Tool. 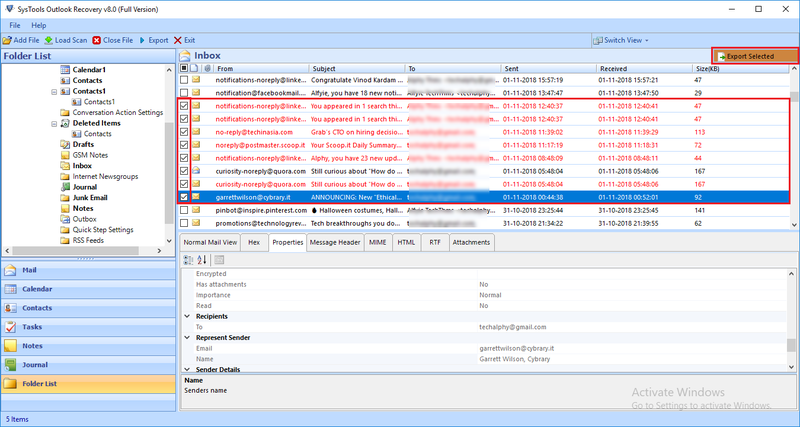 The user can select a corrupted Outlook.bak file (created by ScanPST.exe) directly using Select File / Search File option. The software will scan, repair and load all retrieved data items from the selected Outlook BAK file in the preview panel. You can save this recovered BAK files data items into a PST or PDF, EML, MSG, HTML, etc. Make sure, you have selected BAK file (backup of Outlook PST file) generated by Inbox repair Tool before loading it in software. This PST Recovery tool allows to recover and repair PST file data items like emails, contacts, calendars, tasks, notes, journals, etc. along with attachments. You can save these retrieved PST data items in Adobe PDF format. The utility provides various advanced settings option like, date filter, naming option, messgae header inclusion, Page Layout (Margin, Paper Orientation, Size) & Bates Number (Format, Date Stamp, Position) settings. Export repaired and recovered data from a corrupted PST file to PDF format easily without data loss. Outlook PST recovery tool allows you to rebuild PST file as EML, PDF, HTML or MSG file formats then you can select one of the multiple naming options available to save emails for better manageability. Opt any naming option like: Subject, Subject+Date(DD-MM-YYYY), From+ Subject+Date(YYYY-MM-DD), Date(DD-MM-YYYY)+From +Subject, Date (YYYY-MM-DD)+From+Subject, Date(MM-DD-YYYY)+Subject+From, Date(YYYY-MM-DD)+Subject, AutoIncrement (Only applicable for emails). After performing complete PST file recovery, the Outlook Recovery utility displays a list of complete recovered PST data. Now users can sort the data items on To, Cc, Bcc, Subject etc. (for mails) & export desired items. The date filter option sets a date range & filter emails to recover PST file and restore Outlook PST as PST / EML / HTML or MSG. This option within the Outlook Recovery Wizard helps to save selective data in a date range specified after fixing damaged Outlook PST files. Once the PST file recovery process gets completed successfully, the tool lists all the recovered items along with their meta properties intact. Users can sort the data items directly from the preview pane using this meta-data. Also, one can preview and recover all the email data like To, Cc, Bcc, Subject, Contacts (Personal and Contact Details), Calendar, Tasks, Notes, and Journals along with their attributes. The Outlook PST Recovery software performs complete recovery of lost email items from loaded PST file. After successful Outlook Email Recovery, when users access recovered PST in MS Outlook, all the mailbox folders will be managed with read and unread count as it was in the original PST file. This is a helpful option provided by the tool, as the users won't face difficulty while using the recovered PST data. The application provides 'Export Selected' option to save selected items (like a single email message) in required format. You can also Save Outlook folders selectively like Inbox, Drafts, Sent Items etc locally. You need to check / uncheck the PST folders to be saved. i.e, Outlook PST recovery tool not only allows to export repaired PST file items in bulk, but it also provides option to selectively export specific items from PST file. Users spend so much of their time in assembling an Outlook Distribution List and the accidental deletion of this list feels like a major catastrophe. However, with SysTools Outlook Recovery Tool it is very simple to recover permanently deleted distribution list of MS Outlook PST data file. The software recovers all components of a distribution list such as All Members, Email Addresses, Contacts etc. without any data loss. You can break the PST file size into smaller parts with split PST option, and recover Outlook PST file. Select any required size in MB or GB (Minimum 100MB and Maximum 45 GB) & create PST's of same sizes that are easier to manage. This Microsoft Outlook PST Repair tool helps to rebuild Outlook PST data files without corruptions and errors into multiple smaller PST data files. Graphic interface of the Outlook PST repair tool to fix PST files resembles Microsoft Outlook UI (User Interface). The similar appearance of Microsoft Outlook 2016 / 2019 interface on software panel makes it more user-friendly for all kind of users. So this Outlook PST Recovery Software enables naive and non-technical users to repair PST file from Outlook without any confusions. The software includes Ignore System Folder option that can be used to avoid or exclude the 'Top of the personal folder' in the ROOT (Non-Imp Subtree) folder that comprises Common Views, Favourites, Finder, Freebusy Data, Recoverable Items etc. In addition, it keeps the successive folder intact or unchanged. The feature helps the user to saves Outlook PST Data items like emails, contacts, calendars, tasks, notes, journals according to same folder hierarchy as they are saved in source file. The order and name of files and folders will not be changed even after saving PST files into PST, PDF, MSG, EML, HTML or in using this feature. Once all the items get successfully exported into required file format, the Outlook PST Repair software will generate an Export Report. It provides the success and failure count of items after complete PST data Recovery & Export process. You can also save this Export Report regarding the details of recovered damaged Outlook PST files as .csv for future reference by specifying the destination location. The Outlook PST Recovery Tool provides "Don’t Export Empty Folders" option for the users to exclude or delete Empty Folders in original PST file. For this, you need to Uncheck the "Maintain Folder Hierarchy" option and check "Don’t Export Empty Folders" option for not saving folders which do not contain any data. By enabling this facility, the application will skip all the folders that are empty during the export process. Note: To Export Contacts, Calendars, Tasks, Notes, Journals in PST format, Check 'Use Outlook (Requires Outlook to be installed on machine)' option on Export Option Window. How to use Outlook PST Recovery Tool to repair damaged Outlook PST File in Bulk? Pre-requisites window of the Outlook Recovery tool shows a red cross in front of Outlook component. What to do? I have purchased Outlook PST Repair tool & installed it on my machine. But in pre-requisites Outlook Component is shown with a red cross. What should I do now for fixing Outlook PST files? If you are getting Outlook Component as crossed then you need to register a DLL - Redemption.dll. Know more How to Register Redemption.dll. Understand more about this before you again try to repair PST files. Can I recover ANSI PST File with Microsoft Outlook Recovery Software? Is it possible to recover deleted Outlook emails from Outlook 2002 ANSI PST file? I need to recover deleted Outlook PST data items like emails, contacts, calendars effectively. Yes, you can recover permanently deleted email items from a Outlook 2002 PST file using the advanced Scan mode in the Software. And the recovered pst file will be of UNICODE format and you can import it in all Outlook 2003, 2017, 2010, 2013, 2016 & 2019 version. How do I need to have Microsoft Outlook installed on my machine to recover damaged PST file? Microsoft Outlook installation is not required. SysTools Outlook PST Recovery Tool provides an option to access PST data without MS Outlook Installation. The Microsoft Outlook Email Recovery tool can repair corrupted PST files and restore Outlook data file ad PST, PDF, EML, HTML and MSG format. Why am I getting "Outlook Session Creation Error? If you are getting this kind of error then kindly check whether Outlook is installed and configured properly or not. If Outlook is not configured properly then get it done and then use PST file recovery tool. Is it possible to preview and save encrypted emails from Microsoft Outlook 2016? Yes, PST Recovery software helps remove encryption from Outlook email message and previews it in in-built viewer. 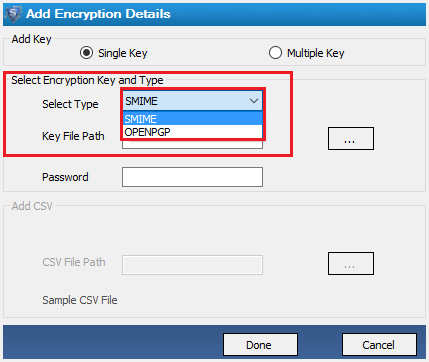 It can decrypt SMIME and OPENPGP encrypted emails and can saves those Outlook emails in PST, PDF, MSG, EML, HTML format. Does Outlook PST Recovery tool impose any file size limitation for recovering PST files? No, PST Repair tool does not impose any size limitation to repair Outlook PST files. Thus, you can fix corrupted Outlook PST of any size from Microsoft Outlook 2007, 2010, 2013, 2016 in Windows 10 and below editions. Can I repair severely damaged PST file in Outlook 2013 account using Outlook Recovery Software? Some important PST data files got corrupted in MS Outlook 2013 account. I am planning to use your product: Outlook PST Recovery to fix corrupted Outlook PST data files. Will your software be able to repair PST file? Yes, by using Outlook PST Repair tool you can easily repair damaged PST file in bulk from any MS Outlook 2019, 2016, 2013, 2010, 2007, 2003, 2002, 2002 versions. It also allows you to recover permanently deleted emails in Outlook PST file. How can I use this Outlook data Recovery Tool for restore corrupted Outloo.BAK & file from Scanpst.exe? You can repair Outlook PST file as well as your Outlook BAK file when Scanpst.exe fails using this SysTools Outlook Recovery tool. Scanpst.exe is the built-in tool for recovering damaged PST files that creates backup of .pst file in .bak file format. In case of severe damages in PST file, Scanpst.exe is unable to repair corrupted PST file issues in Outlook. Scanpst.exe may delete folders from directory if it could not read folder structure. As this Outlook PST recovery Software is meant for PST repair, it also provides option to select your Outlook.bak file from the system. Thus it recover permanently deleted PST items (Emails, Contacts, Calendar, Notes, etc.) from Outlook PST profile as well as outlook.bak file. How to recover PST file data if Outlook crashed suddenly and failed to open? I am using MS Outlook 2007 version on my Windows 7 OS. My Outlook account froze and hang suddenly. It tried to open my Outlook in safe mode and failed again. Now how can I recover Outlook PST files using this Outlook PST Recovery Tool? SysTools PST File Repair Software can recover damaged Outlook PST data files and repair it efficiently. This PST fix tool will rebuild PST file as EML, MSG, HTML or PST as per user need. Thus you can open and use data from PST files from crashed Outlook account. How do I repair Outlook personal folder file (.pst)? Add your Microsoft Outlook 2019, 2016, 2013, 2010, 2007 PST data file in the software, and repair your Outlook Personal folder file with minor and major corruptions efficiently. How to use Free trial version of Outlook PST Repair software? The demo version of SysTools Outlook Recovery tool allows to repair corrupted PST files and recover deleted data from a PST file in bulk. It provides preview of repaired and recovered data items in the software panel. But it limits the export data items option. It only allows to export 25 data items per folder from the PST file. Can I add multiple PST files together in the software? Yes, the software allows to add multiple Outlook PST files at a time and recovers data from them in bulk mode. One can use its Search File option to add multiple PST files. How long it takes to repair the corrupted PST file? The working speed of Outlook Recovery Tool is very high but, the size of the PST file also matters as a large sized PST file might take a long time to scan. How to remove encryption from Outlook Emails? The software allows to decrypt and remove S/MIME and OpenPGP encryption from Outlook email messages. In order to get more information about how to save emails without encryption read the blog. How to Save Export Report after repairing PST file via Outlook Recovery Tool? How to repair an Outlook BAK file using PST Recovery software? Can I run Demo Outlook Recovery software without installing MS Outlook in my system? Yes, the software works with and without Outlook installation. However, demo version fails at times to export data from PST without Outlook. I.e. features like ‘Export’ in the software can be affected with or without Outlook installation in the trial edition. Export: The software allows to export emails with or without Outlook installation. Note: If you are using the demo version of Outlook PST Recovery tool and want to recover contacts, calendars, tasks, notes and journals then, installation of MS Outlook is necessary. In such case, Outlook account must be configured with a valid or dummy POP3 profile. Whereas, in Full Version Emails, Contacts, Calendars, Tasks, Notes, and Journals etc., can be recovered without Outlook installation. Can software recover my distribution list in Contacts? Yes, Outlook Recovery Tool has the ability to recover Outlook distribution list along with other contacts. It recover the distribution list with all users and their information. Can I migrate PST file data into shared mailbox? Yes, you can move PST file data directly into the shared mailbox of MS account. In order to do that you just need to enter the account credentials where you need to export the data of PST file. Will the software support to export emails into groups? No, you cannot to import email messages from a PST file into groups mailbox using this application. How to locate my Outlook PST file on Windows PC? If you have no idea about where your PST file is located on your Windows PC then, you can use Search File option of Outlook Recovery Tool. This option allows to search your PST file within a particular or all system drives. Where is Outlook PST Located? How to pass sleep mode/Hibernation while repairing a large size file in the utility? The power-preservation modes in Windows 10 including Sleep, Hibernation or Hybrid modes occurs various issues while repairing a large PST file in Outlook PST Recovery software. Read more to know how to pass Hibernation while repairing large sized PST. How many email addresses can be retrieved from an email Cc using the software? Lately, I sent a confidential email to all the employees of our organization in cc of the email but, due to corruption in Outlook PST file, I lost that email message. That email comprises the email addresses of thousands of employees in it. So now, before using this tool I want to know how many email Cc addresses can be recovered from an email using this Recovery Wizard? The Outlook Recovery Tool is designed with highly programmed algorithms so that it can recover the email with Lacs of email addresses in Cc. The PST Recovery software does not impose any limitation on the number of email address in Cc, Bcc of any email messages in a PST file. Also, it can recover a subject name that includes N number of character without any difficulty. Does this software provide support to Standard Encoding Type? What is the maximum character limit for the software to recover a subject from an email? The maximum character limit for an email subject is 255 characters in Microsoft Outlook. However, Outlook Recovery Tool allows to recover email subjects more than that and users can recover the email subject up to any character limit received from Gmail or any other emailing services in your PST file. Why do I am unable to read the email body in the preview? If you are facing issues while reading the body part of mail from the preview of email messages then, this is happening due to the different encoding type of that email. Can I recover attachments added in an email attachment from PST file? Yes, you can recover attachments in attachment in the email message from PST file efficiently using our tool. The software provides preview option of all your attachments in the email message. To preview your attachments, you need to selected email with EML file and double-clicking on the EML attachment, it then provides the preview of that email message in a new Window as shown in the image. The attached .eml file is opened in the new window, and it again previews the attached items by double-clicking on it. Why software provides an option to check ‘Use Outlook’ option while export? The ‘ Use Outlook’ option provided by SysTools Outlook PST Recovery tool can be used for different purposes. In Demo Version: Outlook Recovery Tool allows to export 25 items/ folder and users can check the ‘Use Outlook’ option to export 25 data items per folder. In Full Version: This version of the tool allows to export entire data items from the added PST data file. In Demo Version: Exports 25 emails/ mailbox (25 items per inbox, draft, deleted items, junk email, sent item...). It does not export items from contacts, calendars, tasks, notes, journals without Outlook. In Full Version: It exports Everything without any hindrance. How to create a new PST file in Outlook 2010, 2013, 2016, 2019? Do I need to split my PST files to repair large PST files? No, you do not need to split your large sized Outlook PST file to repair it as the software does not impose any file size limitation. But, if you will import the same large sized PST file in Outlook after performing the recovery, then it might get corrupted again. So, you can use Split PST File option provided by this Outlook pST Recovery software to split the resultant PST into multiple small parts and later you can import these small files in Outlook without any hassle. How to import Repaired or recovered Outlook PST data files in Outlook? Open your Microsoft Outlook 2019 / 2016 / 2013 / 2010 / 2007 application. Go to File menu, select ‘Import and Export’ option. Select ‘Import from another program or file' and hit on 'Next'. Now from the Import a File >> Personal Folder File (PST) and hit on 'Next' button. Click 'Browse' and go to the location of repaired PST file to be imported >> click 'Next'. Select the folders >> click Finish. How to fix PST when ScanPST.exe fails to repair PST file? In case when scanpst hangs or fails to repair Outlook data files, it is unnecessary to struggle with the tool. The user can use Outlook PST Recovery software to fix PST files. How to recover a single email from my PST file? If you want to recover a particular email message from the browsed PST file then, you can select the specific email from the preview pane after scanning PST. Can I recover data items from compacted PST file? No, you cannot recover data items from a compacted Outlook PST file. How to recover data from archived PST file in .rar file format? In order to recover data items from archived PST file that is in .rar file format, first you need to extract files from RAR file. After that, you can recover data from this PST file simply using Outlook Data Recovery Software. What is the maximum size limit of a PST file supported by the tool? The tool does not impose any PST file size limitation. However, the Outlook PST Recovery software can support PST file up to 100 GB. I must say that Outlook PST Recovery tool works incredibly to recover and repair corrupted Outlook PST file. As it has successfully repaired archive PST file in my MS Outlook 2007, having almost all of my work in it. Thanks to you guys for helping me to recover permanently deleted emails from Outlook PST. SysTools Outlook Recovery tool was recommended to me by one of my colleague and I was completely not in favor of using the utility to repair PST files. But this Batch PST Repair software proved me completely wrong as it just worked magically to fix and recover Outlook PST files data without any data loss. I really want to thank you for this wonderful Outlook PST Recovery tool. I lost all my MS Outlook 2016 PST file data in Windows 8 OS which includes lots of important information. The Scanpst.exe created backup of my .pst file into .bak file. The PST Repair tool helped me to repair corrupted Outlook BAK files and rebuild Outlook PST files as EML format. SysTools Outlook Recovery Wizard is the name which can help you in worse situation, when you have lost your complete data because of file corruption. The Outlook PST Data Recovery tool not just recovered Outlook PST data, it fixed corrupted PST file in Outlook 2010 and also provided more options to secure it for future. Thanks to you guys. I had many confidential emails in my Outlook 2016 account that needs to be saved in EML file format. All emails were encrypted using SMIME encryption. And this Outlook PST Recovery tool helped me to remove encryption from Outlook email messages without any data loss. This is one of the best feature. Thanks to the developing team!! My MS Outlook 2013 PST files were corrupted and inaccessible. I found SysTools Outlook repair software supports repair multiple PST files option. This Outlook PST recovery software fixes or recovers PST file corruptions in Windows 7 & restored all data. Thanks to its team for creating such a best PST File Recovery tool.